Tallpack International is able to offer a Turnkey solution for the entire process, from weighing, filling and labelling, to pallet preparation. This offers customers a single point of contact when establishing and maintaining the entire process. One supplier means everything becomes quickly operational and service can be planned effectively. Bagged goods are nothing new for Tallpack International. Thanks to many years of experience in palletising and securing bagged goods on pallets, we have been able to establish a solid customer portfolio in bagged goods. However, demands by customers to be even more involved in projects and thus offer even more comprehensive services, presented a challenge that Tallpack could not refuse. Tallpack International went on the look-out for machine-builders who specialised in filling bagged goods. And the perfect match was quickly identified, in BL Bag Line. 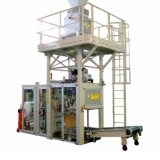 BL Bag Line supplies machines with wide ranging capacities in the field of Form Fill Seal (FFS). BL Bag Line has been a leader in the Form, Fill & Seal method from the very outset. Since 1980, the company has manufactured automatic packaging machines that use innovative solutions to place various products in bags. There has been a path of continuous growth during the company's 30-year history. Before other companies in its sector, BL Bag Line manufactured the first Italian "Form, Fill & Seal" solution and the first weighing scales capable of dealing with over 2300 dosages per hour. BL Bag Line offers complete technical solutions for packaging solids, liquids and powders into industrial bags. 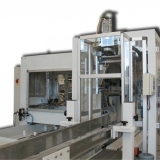 BL Bag Line's FFS packaging machines apply two seals when using tubular film and 3 or 4 seals when using flat film. BL Bag Line's FFS packaging machines are suitable for foil made from polyethylene, polypropylene, plain film and laminated film.